Even though these chapters made me think working in the publishing industry must be this terrible scary think, they also made me hopeful for print publishing. I am a die-hard supporter of the physical book. 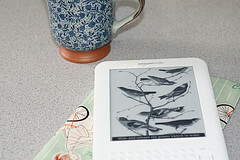 I have a kindle, every once in a while I will use my kindle, but I do not necessarily like my kindle. I like feeling how far I am into a book and being able to easily flip back and forth through the pages. If that makes me a book snob, then so be it. I was excited to see that the percent of books sold as e-books was a lot lower than I, and apparently most people, believe it is. Naomi Baron talks about the pros and cons of e-readers and print books in her article "The Case Against E-Readers" I have told so many people that only 10 percent of books are sold as e-books it is a little ridiculous. It is my number one fact right now.